For the past few months, I've been branching out, trying to sample foods I have never had before. Some things I find that I love, and others... not so much. I remember watching Rachel Ray use leeks in a lot of her recipes, and for some reason, the name just immediately turned me off. Nothing good is ever associated with a leak, so let's just skip that. But, in my recent quest to expand my palate, I recently decided to give them a try. 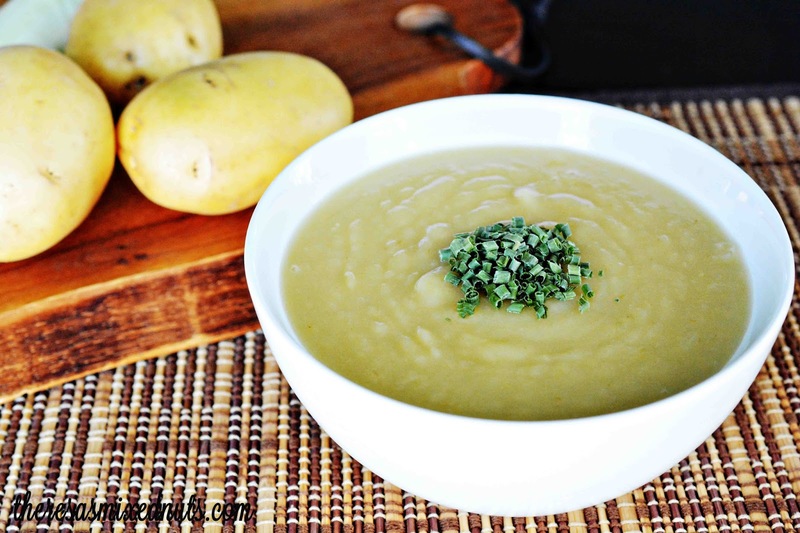 I came across this Irish Potato Leek Soup on Golden Blossom Honey that piqued my curiosity. I love all things Irish (even married into an Irish family) so, why not give it a try? The leek and potato mixture was a winner! However, I'm not sure I am a huge fan of the pureed consistency of the soup. Yes, I know that's how it's served, but maybe next time I'll puree just the leeks with the rest of the ingredients and throw the potatoes in last for a chunkier soup. Overall, it's a great soup to warm up with on a cold winter day! Is there a food that you have never tried before, but are curious about? Yeah, it needed to either be thinned out or extra chunky. I like the idea of adding some cooking cream. I bet some almond milk might even taste good in it too! That's cause you are a weirdo ;) Joking, joking. I don't eat it too often because sometimes it flares my autoimmune disorder, but I will indulge in a bowl here and there. potatoes and leeks are one of my fave..but I never try one with honey..It must be yuuum.. It really is. I find potatoes and leeks are both a little bland in flavor, but the honey added a touch of sweetness to the soup. This looks so tasty! I just had potato soup here at work. You know how you're not supposed to warm things up in styrofoam? There's a reason for that. My bowl was all warped! I'm sure this soup was nothing compared to yours. Yours looks so good! I thought the one my co-worker made was bland! I think I'm going to make potato soup tonight there is nothing better then a nice cup of soup on a cold winter day like today. This looks so yummy. I have never had Irish Potato Leak soup, but I would like to try it. Oh, that looks so smooth and creamy! I haven't had anything with leek in it in quite some time! Ooh, that looks delicious! I would love a nice hot bowl right now! I rarely eat leeks, but they have a great flavor. This sounds yummy. I have actually never tried leeks. I'd be willing to give this a try. This sounds like a great soup. I heard the Irish people have great recipes and dishes. I've been making this soup without the honey. I bet it made the soup tastier. I'm going to try this. Ahhhhh you have touched the Irish in me. I LOVE potatoes! Oh yum! I wonder what this taste like. I've made potato soup before but never with leek. Actually, I would love to try leeks. Lol this soup looks very yummy for a night like tonight. There's a leak/leek in the boat, there's a leek in the boat, lol (Cloudy with a Chance of Meatballs, the one-liner that cracked me up. ;) ). I would try the soup. I love potato soup. This is exactly the kind of soup recipe that is perfect for warming you up on a cold winter day. I would love to enjoy this one after work one of these days. I love potato soup but I have never had leeks before. Sounds like a healthy combination! Soups are always my preferred choice for winter season to keep myself warm & healthy & this looks like a yummy soup that is easy to prepare. We love anything with Chicken & Potato & I am going to try this one during a weekend.